With a new Pelikan demonstrator due out in a few weeks, I thought now might be a good time to revisit how to best clean one. The endearing thing about demonstrators is that they put the inner workings of the pen on display, warts and all. Perhaps that is why the demonstrator is such a polarizing model amongst fountain pen enthusiast. No matter what side of the debate you come down on, it’s undeniable that cleaning this type of pen can be a real challenge. You can see every drop of residual ink and even more disturbing, every stain left behind. Thankfully, good pen upkeep can help to avoid this type of permanent staining. In addition to the usual pen maintenance issues that we all face, there is one exceedingly frustrating area on Pelikan demos that is particularly troublesome to clean. That area would be the section which, no matter how much you may rinse or swab, simply won’t come clean. With Pelikan’s demos, there is a little trick to be learned here which can make your cleaning woes a thing of the past. Due to the design, there is a little lip on the inside of the section where the threads are located. The area behind that lip will collect ink as you fill and use your pen. It is not readily noticeable until you try to flush the pen clean. Thankfully, it’s easy to remedy if you know what to do. Read on to learn how to get that residual ink flushed out of the section. **NOTE: The procedure outlined below will walk you through how to clean the section of a Pelikan demonstrator fountain pen. If you are looking for an overview of how to clean a Pelikan fountain pen in general, please check out my article, How-To: Clean a Pelikan Fountain Pen. Empty the barrel of ink and clean as you normally would. 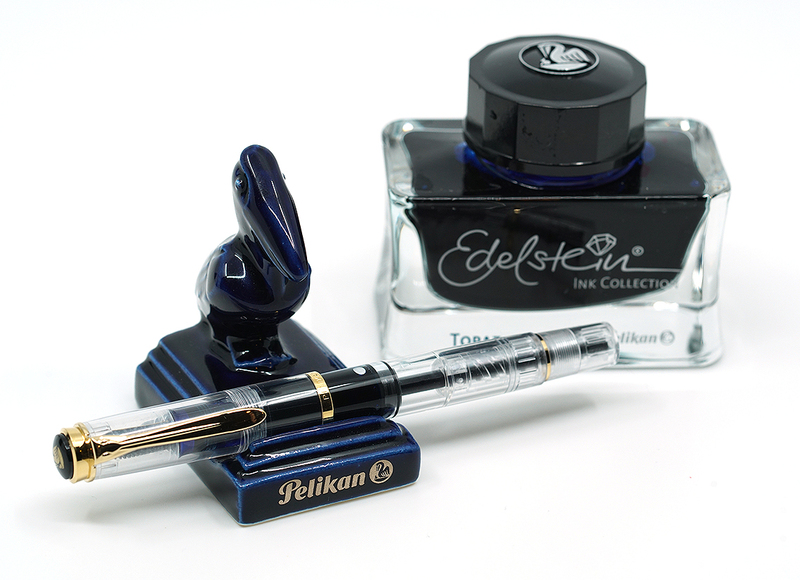 Follow the link above for a tutorial on general Pelikan pen maintenance. When you are satisfied that the pen is clean, carefully remove the nib if you have not already done so and set aside. Unscrew and remove the cap from the pen thereby exposing the nib and feed. Placed the feed in the crook of the index finger on your non-dominant hand with the tip of the nib pointing towards the ground. Take the thumb of that same hand and apply pressure to the top of the nib, thereby preventing the nib from shifting on the feed. Now, with your dominant hand, turn the BARREL counterclockwise to unscrew the nib from the section (the nib itself should never move in your hand). Place the tip of your blunt needle just inside the section. Walk it down the inside of the wall of the section to where the nib threads start. You will feel a lip there which is where you will rest your needle. If significant staining remains due to a particularly stubborn ink, consider using a dilute ammonia solution such as JB’s Pen Flush. Once rinsed thoroughly, allow the pen to air dry. You can use a towel or cotton swab to wick excess moisture. Replace the nib, employing the reverse of the above instructions. If your tap water is very hard, meaning that there is a high mineral content in the water, mineral deposits can be left behind when the water evaporates. For this reason, I favor the use of distilled water (specially prepared to remove chemicals and minerals) over tap. 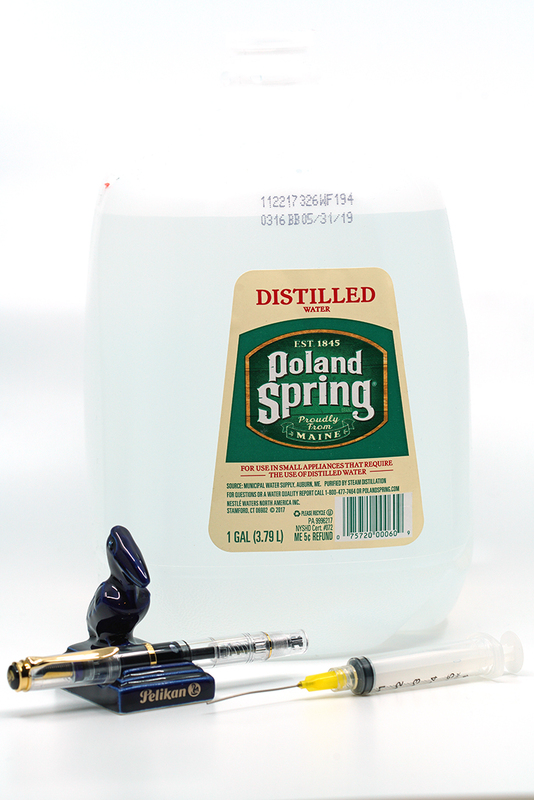 Distilled water is cheap and readily available in 1 gallon jugs at any grocery store. *I am not an expert in pen maintenance and make no claims to be one. I am an enthusiast and hobbyist. If you have any concerns or doubts, you should seek out further assistance elsewhere. Anyone following the above procedures do so at their own risk and I am not liable for any damage that may be incurred to the pen, nib, or cap. Thanks, Joshua. Sure to come in handy. I discovered this method by mistake when I bought an M400 nib for my M200 Clear Demonstrator. When I was changing the nib, I though, well, I’ll clean the pen. I found using the piston too slow to pull water in and out (being the impatient person I am). So I just got my syringe and went to town. Happened upon that place in the section and saw ink and flushed it out. I’m glad you wrote this article; it will help lots of people who may not have happened upon this method before. While I’m guilty of not cleaning a pen maybe as often as I should, when I do clean it, I want it to be totally clean. It’s not an intuitive things so it’s serendipity that you came across it. Like you, when a pen is supposed to be clean, I need it totally clean. Ink in the section like that would kill me. Excellent instruction on cleaning the Pelikan demonstrators. Bravo! Thanks Joshua. I have a blue demonstrator M205 and had noticed that after flushing, there was still some ink residue trapped between the walls of the grip section, that could not easily be wiped off from inside or outside. Also, the “section” does not separate from the barrel. I will try using the syringe, as a mini pressure-jet cleaner and that should do it! The syringe is the only way that I’ve figured out how to address this problem so far. It should get your blue demo M205 back to like new condition. Good luck. It could also be really practical to show those who wonder why their “cleaned” pen shows weird ink-mixing. It is somewhat hard to explain to people that there is that “pocket” or gap within the section walls especially in every other than the clear models. Some people might not even believe you, yet our flock is all built the same. I am sure in the future I will direct others more than once to your video to show where the ink really hides. Definitely hard to explain, especially since it’s somewhat of an unusual design. Hopefully the video was clear enough to illustrate the problem and the solution. It definitely is and that is why it’s all the more helpful. Thank you! I have a M1000 Demonstrator and to get the section clean I remove the nib unit, fill the barrel with distilled water right to the top and let it sit upright for a day. The capillary action frees the trapped ink in the glued section and once diluted it is easily flushed. Sounds like the patient man’s approach but same principal at play. Jealous of your big demo there. Don’t have one of those myself. This was super handy, thanks so much!